← Sell your gold and win a share of $10,000 this month! The lovely Opal! The birthstone for the month of October, as well as the Tourmaline. Opals are definitely gemstones that will never go out of style. The prism like colors in the opal make it a perfect choice in jewelry to match any outfit you are wearing! How did the Opal get it’s name? – The word opal is adapted from the Roman term opalus, but the origin of this word is a matter of debate. However, most modern references suggest it is adapted from the Sanskrit word úpala. Some facts about the Opal – Opal is the national gemstone of Australia, which produces 97% of the world’s supply. They are also mined in Brazil, Mexico, United States and Canada. Opal’s internal structure makes it diffract light; depending on the conditions in which it formed it can take on many colors. Opal ranges from clear through white, gray, red, orange, yellow, green, blue, magenta, rose, pink, slate, olive, brown, and black. Of these hues, the reds against black are the most rare, whereas white and greens are the most common. 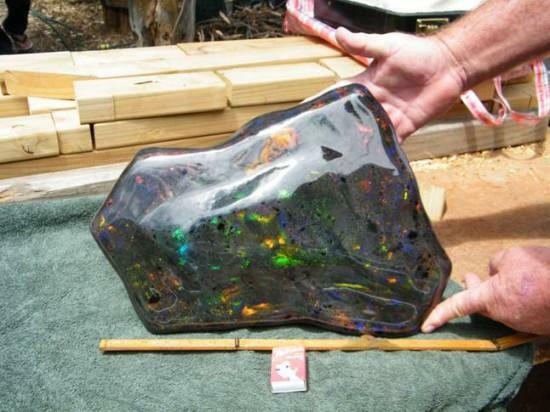 World’s Largest Opal Matrix – Stuart Hughes recently discovered a 55,000 carat opal that was found in Australia. The estimated value is $1 million dollars! Superstitions behind the Opal – In the Middle Ages, opal was considered a stone that could provide great luck because it was believed to possess all the virtues of each gemstone whose color was represented in the color spectrum of the opal. However, around 1829, a book came out called Anne of Geierstein, where a character in the book wears an opal necklace with supernatural powers, causing the sale of opals to drop 50% in Europe, and until around 20 years after. Can you clean an opal, like any other gemstone? – Opals are rarely treated to enhance their color, however they can be pretty delicate. Opals shouldn’t be exposed to any harsh elements or worn while you are doing any bold sports or activities. For example, you shouldn’t wear your opal ring, while rock climbing! Also, it’s really easy to clean your opal, all you need is a soft damp or dry cloth to polish it up to it’s colorful beauty! 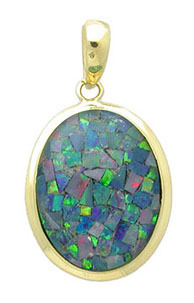 See our collection of Opals online, or come in any Jewelry Warehouse to see them in person. This entry was posted in Birthstones, Jewelry and tagged october birthstone, opal, opal birthstone, opal jewelry, opals. Bookmark the permalink.